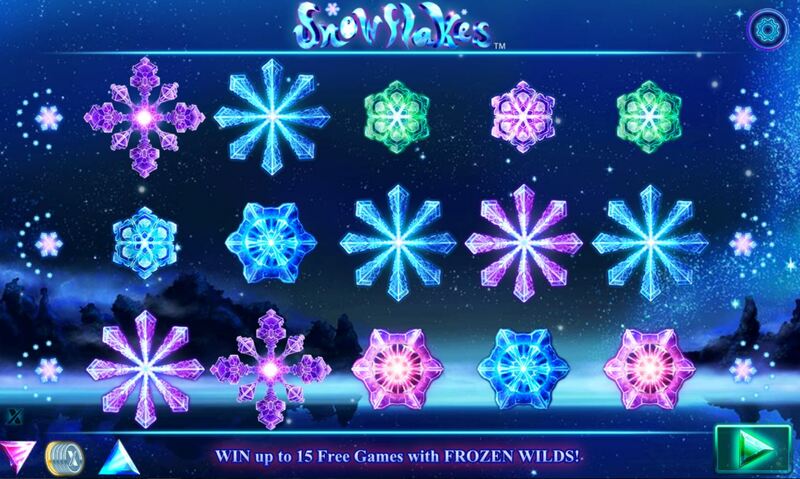 Snowflakes slot has a chilly and wintry theme as you may expect from the title. 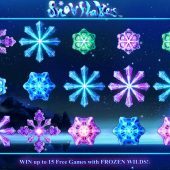 A cool blue background is overlaid with a 25 pay line game over 5 reels and 3 rows and you are presented with various snowflake shapes. It has been said that no two snowflakes are identical, and neither are any of the nine different ones we see here. The reels spin quietly with a gentle muffled sound when they stop, in keeping with the acoustics of a good deep snowfall in the real world, only alerting you when Wilds, wins or scatters land. So, there are Wilds on all reels in the form of ice cubes and they make the highest base game pay of 20x your stake for 5-of-a-kind with the rest of the snowflakes paying from 16x stake down to 4x stake for a similar reels win. Scatters are present too on all reels represented as ice globes and 3 or more will trigger the game's free games feature. Before we arrive at this, there are 2 different random in-play Wild features to consider. Icy Wilds - after the spin 1 to 5 Wilds may appear, always on separate reels to increase the chances of a win. Wild Wind - slightly different from the above in that the 1 to 5 Wilds are placed on the reels before they stop, so that wins aren't counted until the rest of the positions have landed. Landing 3, 4 or 5 scatters will trigger a series of free spins. You will be awarded 7, 10 or 15 respectively and they can retrigger. The enhancement here is that any Wilds that appear will be 'sticky' fort he rest of the free games, or in other words in accordance with our there, frozen in place. This is similar to bonus spins in games like Netent's Dead Or Alive and Yggdrasil's Cazino Zeppelin and due to the potential of increasing wins as Wilds build up is a popular format amongst players. The variance of Snowflakes slot though is far gentler, so even if you filed the screen up with Wilds, the maximum pay would be less at 500x stake.